In the late 19th century, Art Nouveau appeared all over the world: In Austria, the style was called “Secession,” while, in Germany, it was known as “Jugendstil.” In Russia, Art Nouveau was known as “modern” or “northern modern.” Here, the style most strikingly manifested itself in architecture. Russia’s 25-year flirtation with Art Nouveau came to an end with the first Russian Revolution and the rapid historical developments that followed. The Russian “modern” did not catch on under the new Socialist regime; instead, the architectural image of the country of the Soviets became minimalist constructivism. Nevertheless, over the course of two and a half decades, Art Nouveau buildings managed to decorate Moscow’s historic center, and they remain there to this day, rustling ornate flowers on hedges and sparkling with the foreheads of plaster angels and three-cornered porticoes—like an intricate monument to a faded empire. Toward the end of the 19th century, Moscow surpassed all of Europe’s large cities in terms of construction activity. Thanks to a young generation of industrialists who had been educated abroad, many multi-dwelling units and mansions done in the modern style rose in the city center. Art Nouveau structures can be found on the boulevard ring, in the Old Arbat district, on Tverskaya Boulevard, in the Kitay-Gorod districts and on the aristocratic Povarskaya and Prechistenka streets. During the early period of Art Nouveau, Russians reacted ambivalently to the new architectural style. In this vein, the mother of the wealthy Moscow merchant Arseny Morozov did not hold a particularly favorable view of his new mansion (1885–1899): “Before, only I knew that my son was a fool, but now all of Moscow will know it.” Ornamental towers, winding columns, carved balconies and miniature seashells all over the facade earned the building the name “Moorish palace.” Located near the Kremlin’s walls, this palace, created by architect Victor Mazyrin in the Moorish revival style, garnered harsh criticism from the Moscow community. One of the classic figures of the Russian modern is Fyodor Schechtel, who drew, among other things, the plans for the Yaroslavsky train station, the Derozhinskaya mansion and the Moscow Art Theatre, which was headed by Konstantin Stanislavsky and stands in Kamergersky Lane. He also created the image for the theatre’s curtain—a flying seagull set on the backdrop of a wave. This remains the MAT’s official logo. It is notable that one of Schechtel’s best projects, Savva Morozov’s house, is one he planned and built without having architectural training. Morozov, a graduate of Cambridge University, gave the architect free reign, as long as he implemented Morozov’s desired style—English neo-Gothic. Morozov hid Bauman, a revolutionary, in this house. In the reception area built for the Moscow governor-general, Lenin’s comrade-in-arms sat behind a table with Moscow’s chief commander, while Moscow’s entire police force searched for the revolutionary. Nevertheless, Schechtel’s most celebrated project was the unrealized plan to build Lenin’s Mausoleum in the form of a large glass pyramid. Schechtel was, in his own way, looking into the future: The plan for the mausoleum, which was supposed to be included in the Red Square complex, brings to mind the Louvre’s pyramid that was erected in the late 1980s. 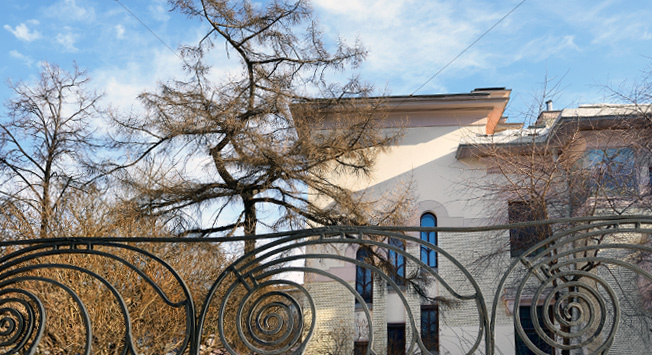 The first master—and one of the most important—of Art Nouveau in Moscow, Leonid Kekushev, began his career by building his own mansion on Glazovsky Lane. His portfolio includes many significant structures—a set of mansions in the prestigious central neighborhood of Ostozhenka, multi-dwelling units in the nearby Khamovniky, and the Metropol Hotel, whose rooms had telephones and hot water (an oddity for the early 20th century). In 1906, Moscow’s first two-auditorium movie theatre opened near the hotel. Kekushev’s style is described as resembling Victor Horta’s Franco-Belgian Art Nouveau. This is now a museum dedicated to the Soviet writer Maxim Gorky. Open daily, 11 a.m.–4 p.m., free admission. Tours conducted only in Russian. Inside is the Government Reception House of the Russian Federation; it is closed to tourists. However, walking around the palace and photographing the famous “conchas” (seashells) does not take any effort. Both the theatre’s building and all of Kamergersky Lane are a monument to Moscow Art Nouveau. Over the theatre’s main entrance is the “Wave” bas-relief, which was also made in the Art Nouveau style. In addition, it is worth visiting the nearby restaurant and taking in a performance at the theatre, which is still considered one of Russia’s major dramatic theatres. Tickets start at $13. It is worth walking past the building and viewing it from the other end of Komsomolskaya Square. In coming up with the station’s plan, Schechtel imitated the architecture of northern Russian village cemeteries, and this is noticeable from a glance at the station’s massive black roof. The hotel is located just steps from Red Square, in the heart of Moscow—it is virtually impossible to miss it. Viewing the facade and mosaic panel is free, while a one-night stay starts at $260.